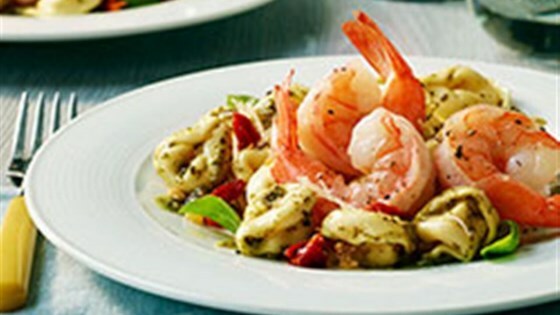 "Sautéed Garlic Shrimp combined with Three Cheese Tortellini, sun-dried tomatoes and basil make a tasty, colorful, and elegant lunch or dinner main dish." Didn't have dried tomatoes, instead chopped a whole tomato and cooked with shrimp and garlic. Had a container of pesto on hand. VERY GOOD. This is an easy and flavorful pasta dish. My husband doesn’t care for sundried tomatoes so I chopped some fresh tomatoes for his portion and used sundried for mine. Everyone enjoyed it. This is a great tasting, easy to prepare, suitable for company recipe. I did use a bit more garlic and shrimp than called for in the recipe, but other than that, no additions. Terrific meal! Left out the sun dried tomatoes and it was great! My husband loves it! Great! Did not have any fresh basil,but still really good.